Materials: oil on canvas. Dimensions: 32 x 49.5 cm. Acquisition date: 1911. Nr. : KMS3123. Source: http://soeg.smk.dk/Vark.asp?Type=Udvidet&ObjectId=4938. P.S. I have changed the light, contrast and colors of the original photo. 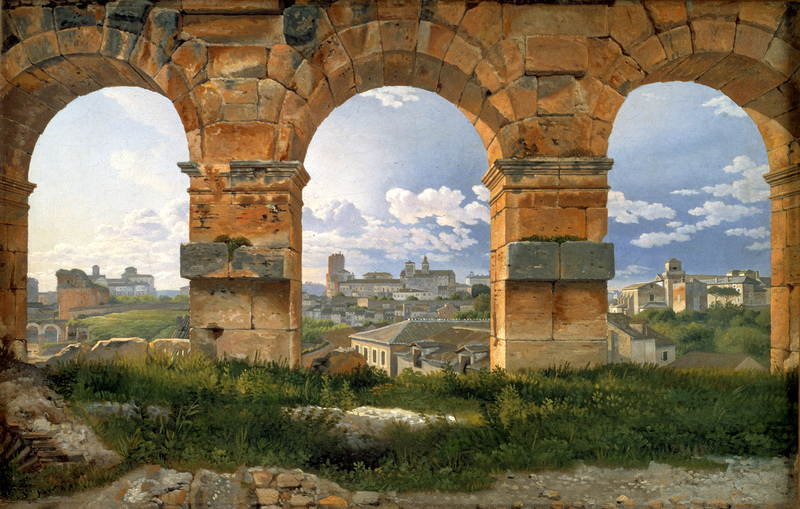 Eckersberg udførte ifølge notitser i sine breve og sin dagbog en række malerier i Colosseum i 1815-16. Maleriet er formodentlig udført i 1815 i umiddelbar forlængelse af kompositionstegningen (KKS2001-1), der efter al sandsynlighed er udført dette år. Note til motiv og relaterede værker: Eckersberg har givet en indgående beskrivelse af motivet og omtalt de enkelte bygninger i kataloget til Kunstforeningens udstilling i 1828 (kat.nr. 157; citeret i ‘Dansk Guldalder’ 1994). Maleren har stykket baggrundens udsigt sammen af tre udsigter: Når han stod foran den midterste bue, kunne han kun se bagrundsmotivet i den midterste bue. For at se de andre udsigter, måtte han gå henholdsvis to skridt til venstre og fem til højre (jf. Kasper Monrad, “Udsigt gennem tre buer” i udstillingskataloget ‘Under samme himmel’, Thorvaldsens Museum, København 2000, s. 13). Proveniens: Solgt 1854 på Eckersbergs auktion til Professor Bagge (kat.nr.17). Hr. Etatsraad Bagges dødsbo (1895). Solgt 1911 af O. Bagge til Statens Museum for Kunst(http://soeg.smk.dk/Vark.asp?Type=Udvidet&ObjectId=4938). Materials: oil on panel. Dimensions: 48 x 62.5 cm. Inscriptions: signatuur: I. Ekels. Nr. : SK-A-689. Source: http://www.rijksmuseum.nl/collectie/zoeken/asset.jsp?id=SK-A-689&lang=nl. P.S. I have changed the light and contrast of the original photo. Links het Stadhuis, daarachter de Nieuwe Kerk, rechts de Waag (http://www.rijksmuseum.nl/collectie/zoeken/asset.jsp?id=SK-A-689&lang=nl). Materials: oil on canvas. Dimensions: 44.5 x 54.6 cm. Inscriptions: signed. Acquisition: Salting bequest, 1910. Nr. : NG2567. Source: http://www.bbc.co.uk/arts/yourpaintings/paintings/vessels-in-a-fresh-breeze-116161. Jacob van Ruisdael was primarily a landscape painter but he did paint a handful of seascapes. In this painting he has chosen a high viewpoint, with more than half the canvas being devoted to a dramatic cloudscape. None of Ruisdael’s seascapes are dated and they are, therefore, difficult to place in his career. There is a group of seascapes influenced by Jan Porcellis (about 1584 – 632), which are presumably early works. This belongs to the group of more mature seascapes and probably dates from the early 1660s (http://www.nationalgallery.org.uk/paintings/jacob-van-ruisdael-vessels-in-a-fresh-breeze). Materials: oil on canvas. Dimensions: ? No information on the site of the Russian Museum. 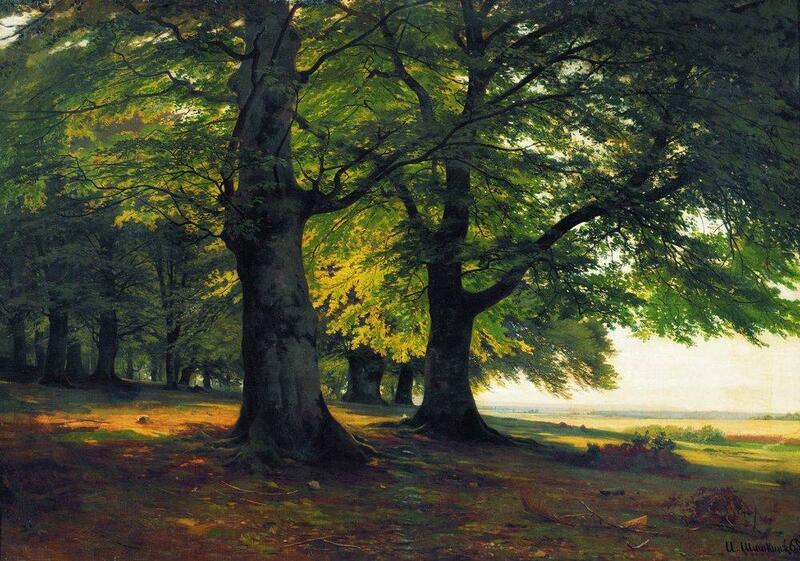 Source: http://uploads0.wikipaintings.org/images/ivan-shishkin/the-teutoburg-forest-1865.jpg. Canaletto arrived in England at the end of May 1746 and soon afterwards must have been introduced to the young Francis Greville, Lord Brooke (later Earl of Warwick). A series of four payments in Lord Brooke’s account from 1748-52 indicates that Canaletto made at least two visits to Warwick. The view is over the lawn within the court of Warwick Castle and encompasses left to right, Guy’s Tower, the Clock Tower and an entrance gate, Caesar’s Tower. Through the gate, the spire of the church of St Nicholas can be seen. In this, Canaletto has made some pictorial adjustments in that the spire cannot actually be seen from this point. The two newly planted fir trees to the right of the gate are probably early evidence of ‘Capability’ Brown’s landscaping for the courtyard (http://vads.ahds.ac.uk/large.php?uid=91613).